EGYPT "Egypt's military want order, but we fear new anti-Christian attacks"
"Egypt's military want order, but we fear new anti-Christian attacks"
Fr Rafic Greiche, spokesman for the Catholic Church, tells AsiaNews that Islamists could lash out at Christians again when former President Morsi goes on trial on 4 November. As army and police try to maintain order and security, Essam el-Erian, a leading Islamist leader on the run since July, is captured. Islamist sit-in at Al-Azhar Islamic university ends without serious incidents. Christians in Al-Warraq defy extremist threats and celebrate six weddings a week after an attack left five people dead. 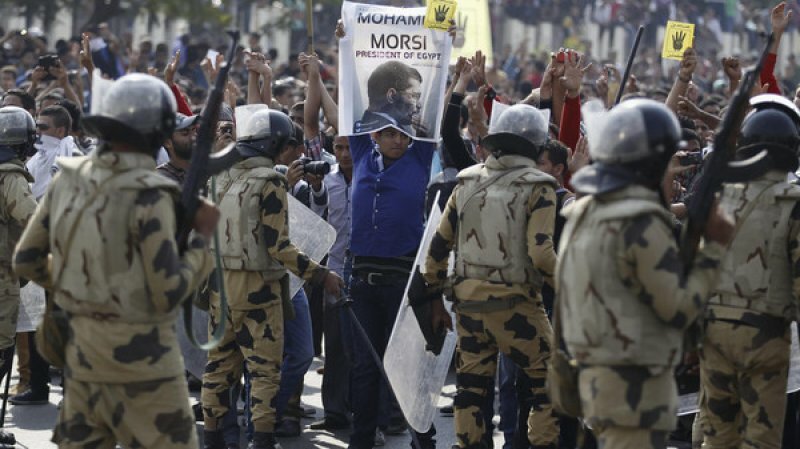 Cairo (AsiaNews) - "More anti-Christian attacks could occur at the start of the trial against former President Mohamed Morsi, set for 4 November," said Fr Rafic Greiche, spokesman for the Egyptian Catholic Church. Speaking to AsiaNews, he expressed his personal fears that a wave of violence might fall on the country like the one that hit on 14-17 August. For the clergyman, the climate of chaos created by Islamist protests has worsened the situation for the Christian minority. On 20 October, armed gunmen attacked a wedding party outside the Church of the Virgin Mary in Al- Warraq, killing five people, including an 8-year-old girl. Still, "the authorities seem steadfast in their decision to restore security and control in the country," he added. In view of President Morsi's ouster on 30 June in the wake of a mass rally against him by some 30 million people, police today arrested Essam el-Erian, vice-president of the Muslim Brotherhood's political wing, the Freedom and Justice Party. He was on the run since July. The arrest of the vice-president of the Islamist party comes after the resignation of Mohamed Amin Fahmi al-Qarmouty, the judge assigned to the case against Brotherhood's supreme guide Mohamed Badie, his deputy Kairath al-Shater and Rashad Bayoumy. "The court decided . . . to withdraw from looking at the cases because it feels unease," Qarmouty said, indirectly acknowledging the Islamists' capacity to intimidate. Still, police took back al-Azhar University from thousands of students and thugs who had occupied it, Fr Greiche noted. In their takeover, they "had also seized the university dean thanks to militants who had provided them with knives, iron bars and stones," the Catholic Church spokesman said. For the first time in three years of continuous demonstrations, the sit-in was cleared without any major incident. Nonetheless, the atmosphere remains tense. So far, the few peaceful attempts to respond to the chaos have come from the persecuted minorities, not the government. On 27 October, Christians in al-Warraq braved the climate of hatred and the fear of new Islamist attacks by meeting at the Church of the Virgin Mary and St Michael the Archangel to celebrate the marriage of six young couples. For Coptic Orthodox Archbishop Dawood Ibrahim, the event is a sign of hope for all Egyptian Christians shocked by the attack on 20 October. On that occasion, two men on a motorcycle fired at the people who had gathered at the church for a wedding. "Until a month ago, I tended to discourage couples from marrying together in accordance with Coptic tradition, so as to avoid incidents with Islamists," the prelate said. "However, I have changed my mind after the attack on 20 October. Today, these celebrations are a sign of unity, showing that Christians are not afraid of weapons and threats."